In the year 2097, the entire earth was enveloped in a cataclysmic climate shift, plunging the globe into another ice age. Over 90% of the world's population was eliminated, driving the survivors to band together into loose communities and tribes.Each player is the leader of a small tribe of survivors. Resources, tools, medicine, and mercenaries are all in scarce supply. Each tribe is pitted against other tribes in a fight for survival. The players build up their tribes, skirmish against other players' tribes, and can even bluff on the way to victory. The leader who gathers the largest tribe will win the game. 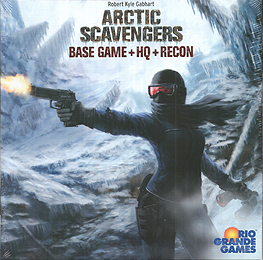 The first expansion for Arctic Scavengers introduces the notion of a base camp or headquarters for each tribe. This base camp consists of a Tribal Leader (complete with special abilities) and the potential to construct buildings that can be used strategically during game play. Additionally, the game introduces alternative victory paths, new mercenaries, new tools, and the addition of the "engineering schematics" pile. As the tribes evolved further and struggled for dominance information has become the most valuable currency. In this new world, deception reigns, leading to a need for reconnaissance. This version comes with a plastic insert to organize all your cards for ease in play setup. Arctic Scavengers is a deck-building game that incorporates a bluffing element to it. The game is highly thematic and set in a future where another ice age has enveloped the earth. Think The Day After Tomorrow kind of thing. Artwork & Components: The artwork is what drew me initially to the game, it's awesome. Very realistic and gritty, which I like, particularly given the theme. The iconography on the cards is clear, simple and makes sense (take note Race For The Galaxy) which helps a lot with a deck-builder. Cards are good quality and are cut well. Gameplay: Plays are looking to use cards from their draw pile to recruit more members to their tribe, using food they have hunted or medical supplies they have acquired. Different people have different strengths, so the refugees are pretty much good for nothing, although they can dig and hunt if you equip them with tools. However their are medics, group leaders, scouts and brawlers you can recruit that offer better abilities to improve the effectiveness of your deck/tribe. Players must be careful not to commit too many cards to the recruit phase though, as they must also allocate some cards with fighting abilities as at the end of each round there will be a skirmish and the winner will gain a valuable 'contested resource' card, which is always an excellent card. The other thing players can do is to commit cards to dig in the junkyard for items of use and value. There are also engineers who can use schematics to build useful buildings for your tribe, each with it's own ability. There are other things I could mention, all which improve the thematic feel of the game, but in short the winning condition is the person with the most people and therefore the most successful and strongest tribe. Overall thoughts: Absolutely love this game. Pure and simple. I've played Dominion and Star Realms but I consider this to be far better, and it's all about the theme and the interesting decisions you have to make in order to balance your actions, just like you would have to in the landscape the game creates for you. this game seems to have slipped under the radar a bit and I don't know why, get involved with it, it's brilliant. This review is for the reprint version with the new Recon expansion which I haven't played yet but having looked at the rules and cards I can see that it adds yet more depth and strategies that perfectly integrate with the theme yet again. AWESOME.